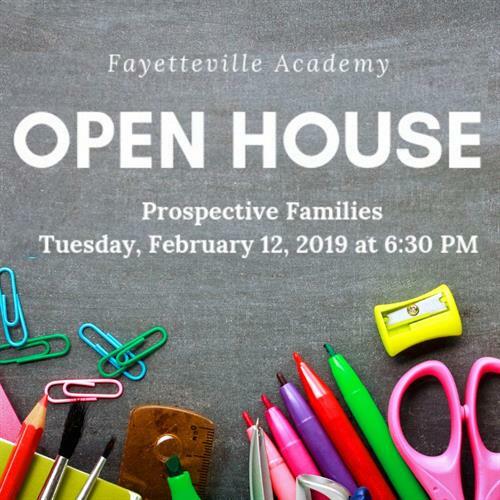 Join us for our Open House and learn why Fayetteville Academy is the areas premiere private, independent school. At Fayetteville Academy, we pride ourselves on upholding a tradition of academic excellence that began in 1970. The Academy is the only independent, non-sectarian, PK – 12th grade school in Cumberland County. We provide a unique learning environment where children are encouraged to explore every opportunity, set and exceed expectations, and expand their knowledge base daily. Small class sizes, a safe and caring atmosphere, and numerous extracurricular activities ensure that each child at the Academy receives a unique educational experience. Tuesday, February 12, 2019/6:30-8:00 p.m.